Why you AND your dog need doggy daycare! Doggy daycare is perfect for high energy dogs, dogs that need constant entertainment, puppies during potty training, dogs that like to romp and play, dogs that need to be socialized and dogs that need to give their owners a break! Happy Tails Doggy Daycare is open Monday-Friday 7AM-5:30PM. We have big dogs come play Monday, Wednesday, Thursday and Friday during the week and Tuesdays are reserved for the "little ones." Playtime, storytime and treats will keep even the most active pup entertained all day. The dogs that come here get dropped off in the morning FULL of energy. They play here all day with 15-20 other dogs, toys and games and then go home EXHAUSTED at night. Before any dog starts daycare, we require proof of current vaccinations from your vet and have a convenient enrollment form you can print out. A 24-hour advance reservation is required. The only thing you need to bring to daycare is a leash and food if your dog is still eating a noon meal. We provide treats, activities, and an exhausted dog for you at the end of the day! 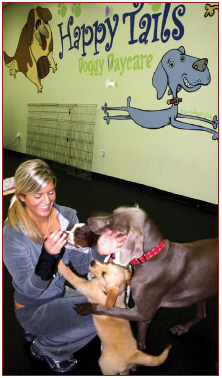 Happy Tails is owner-operated and always accommodating to each dog’s specific needs. Let me know if there are any questions I can answer for you! Call 515.270.0078 or email us today!